This is the first of three posts working through a project looking at Measuring Recording and Exploring temperature measurements with the Raspberry Pi. This project will measure the temperature at multiple points using DS18B20 sensors. This project will use the waterproof version of the sensors since they have more potential practical applications. This project is a logical follow on to the Single Temperature Measurement project. The differences being the use of multiple sensors and with a slightly more sophisticated approach to recording and exploring our data. It is still a relatively simple hardware set-up. To connect the sensor practically can be achieved in a number of ways. You could use a Pi Cobbler break out connector mounted on a bread board connected to the GPIO pins. 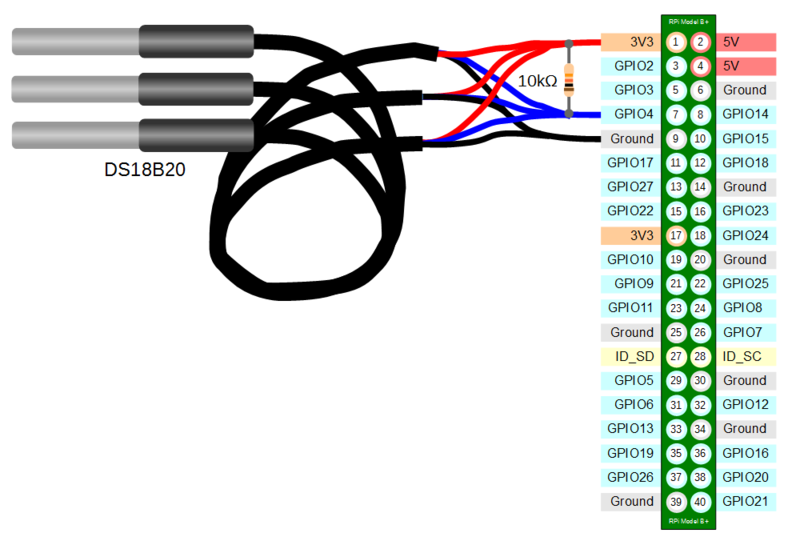 But because the connection is relatively simple we could build a minimal configuration that will plug directly onto the appropriate GPIO pins. The resister is concealed under the heatshrink and indicated with the arrow. The cat program takes the specified file (or files) and by default outputs the results to the screen (there are a multitude of different options for cat, more can be seen in the Glossary). At the end of the first line we see a YES for a successful CRC check (CRC stands forCyclic Redundancy Check, a good sign that things are going well). If we get a response like NO or FALSE or ERROR, it will be an indication that there is some kind of problem that needs addressing. Check the circuit connections and start troubleshooting. cd into each of the 28-xxxx directories in turn and run the cat w1_slave command to check that each is operating correctly. It may be useful at this stage to label the individual sensors with their unique serial numbers to make it easy to identify them correctly later.